A Nevada rancher's threat to wage a "range war" with the federal Bureau of Land Management precipitated a standoff today between supporters of the embattled rancher, Cliven Bundy, and law enforcement officials. Bundy posted a statement on the Bundy Ranch website on Sunday night saying: "They have my cattle and now they have one of my boys. Range War begins tomorrow." He invited supporters to show up this morning on his property, about 80 miles northeast of Las Vegas, near Bunkerville, just west of the Utah state line. BUNKERVILLE, Nev. -- Dozens of armed federal officers are preparing for a showdown with a Nevada cattle rancher regarded by some as an outlaw and a hero by others. Rangers and agents from several federal agencies have surrounded a 600,000-acre section of public land and are preparing to move against rancher Cliven Bundy whose cattle have been grazing illegally for the past 20 years. Bundy has had a long time to sharpen his message. The fight has been building since 1993, when the Bureau of Land Management changed grazing rules for Gold Butte to protect the endangered desert tortoise. Bundy refused to go along and stopped paying his fees. 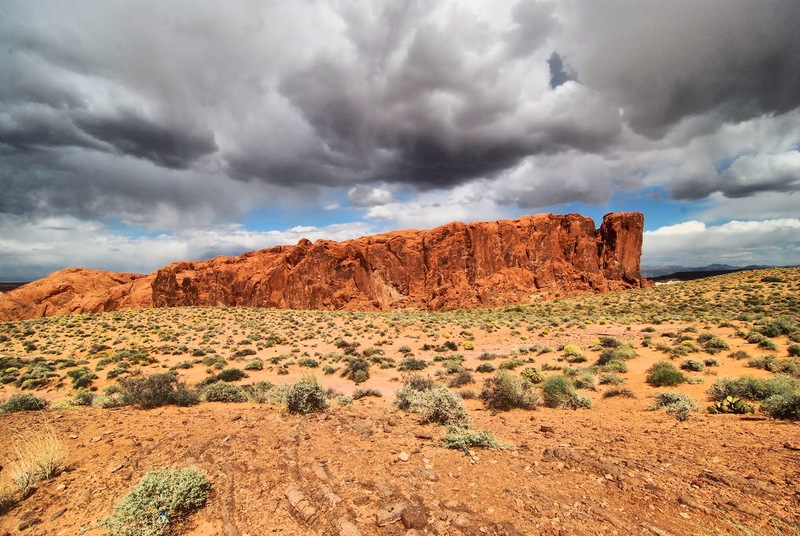 Since then, the BLM and federal courts have ordered him to stop letting his cattle roam throughout Gold Butte, and he has ignored the orders because he does not recognize federal authority over the land. "My forefathers have been up and down the Virgin Valley ever since 1877. All these rights I claim have been created through pre-emptive rights and beneficial use of the forage and water. I have been here longer. My rights are before the BLM even existed," Bundy said. The Bundy family was already ranching here long before the Department of Interior was born, and long before tortoises were protected. But federal courts say he doesn't have a legal leg to stand on. BLM has long sidestepped the fight in part because of concerns about what might happen, if it tried to round up his 500 or so cattle that even now are grazing on forbidden public lands. Read the whole thing - it's an excellent and reasonably evenhanded analysis of the situation out there. To quickly summarize the situation, Cliven Bundy's family has been supporting cattle on a 600,000 acre stretch of federally owned land south of the Virgin River (map) since the tail end of Reconstruction. Back in the 1990's, however, the federal government began to severely restrict land use on public lands, even more so than they had historically - these restrictions ultimately led to a heating up of the Sagebrush Rebellion and the Jarbidge Shovel Brigade, among other acts of protest. In Cliven's case, this led to the BLM restricting access to Gold Butte, Cliven refusing to acknowledge this restriction, then two decades of court cases that have more or less consistently gone against Cliven each and every time. Now, driven in part by a potential suit against the BLM by environmental groups for failing to properly enforce the court ordered restrictions on Gold Butte, the BLM and the federal government have started to seize the cattle that Cliven left to graze on BLM property. As often happens with situations like this, there's the small picture - the issue of Cliven and his cattle - and the larger picture. At a base level, the simple truth here is that Cliven and his family wouldn't be losing their cattle at all if they purchased the land that their cattle have been grazing for several years. Since Cliven does not own Gold Butte, it's up to the landowner - in this case, the BLM, which "inherited" the land from the General Land Office, whose existence can be traced back to The Land Ordinance of 1785 - to decide how to properly dispose of that property, and the landowner has decided that it would rather have tortoises on Gold Butte than cattle. One can stop their analysis of the situation here - and I did, at least for a little while - and safely conclude that Cliven is wrong, the BLM is right, and the BLM is well within their rights to defend their interests in their property by any means necessary. But there's a catch - did Cliven's family ever have the opportunity to claim title to the land? The answer to that questions is probably "no". Both the Desert Land Act and the Stock-Raising Homestead Act limited homestead claims to 640 acres; even if the Bundy family worked together to stake several claims, it would take over a thousand family members building shacks in the desert to successfully claim that much land. Furthermore, the federal government generally avoided selling range land outside of Homestead Act-style provisions to avoid charges of corruption. Finally, the federal government transitioned from homesteading public lands to leasing them in the 1920's with the Pickett Act and the Mineral Leasing Act of 1920. However, federal leasing requirements were relatively lax, at least initially - the US Forest Service and US Grazing Service preferred to maintain a relatively "hands off" attitude regarding leasing fees and restrictions, lest they earn the legislative ire of powerful rural Senators and Congressmen. Consequently, the Bundy family undoubtedly assumed, and rightfully so at the time, that it was better to pay the federal government a nominal lease fee every 10 years than it was to own the property outright and pay Nevada property taxes. Unfortunately, as so often happens when you rent, your landlord can change their mind - they can raise the rent, they can decide to use the property for something else, or they can just evict you because they think you haven't been a good tenant. In the case of Cliven's cattle ranch, as well as several other agricultural and mining operations in Nevada, all three happened more or less simultaneously when the federal government transitioned from an economically driven land management regime to an environmentally driven one. In short, no, the Bundy family almost certainly did not have any opportunity to buy their range outright; even if they did, it probably made solid economic sense for over 100 years to let the federal government manage the land and lease it at extremely low rates instead. However, that's not the end of the discussion - how did the federal government in general, and the BLM in particular, end up with 600,000 acres of range in the first place? I'll go into that in my next article.